In dentistry, indices are values that are assigned to quantify the incidence, prevalence, and severity of disease. This paper calls attention to a working classification proposed for indices based on its relationship with nine dental specialties with literature search of indices used in dental research in the PubMed database. Indices are epidemiological tools used to study the incidence, prevalence, and severity of dental diseases. There is no working classification for indices based on its relationship with other dental specialties in the literature. 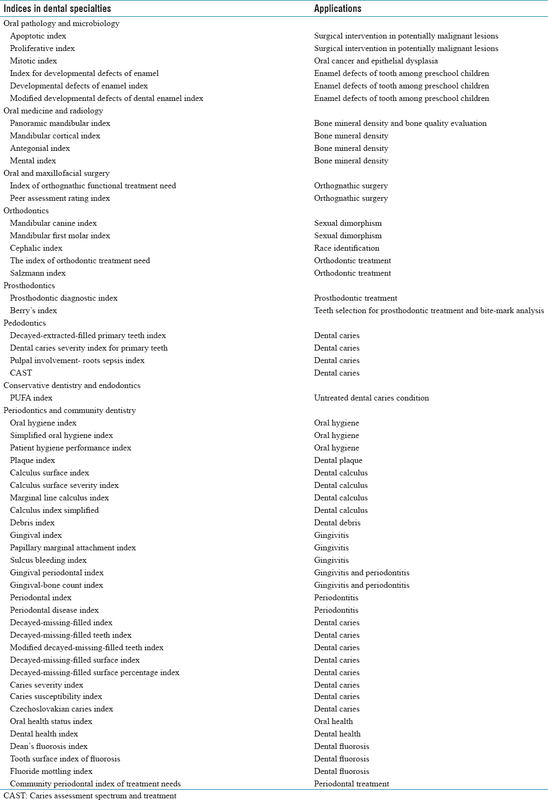 This short communication calls attention to a working classification for common indices based on nine dental specialties, namely oral pathology and microbiology, oral medicine and radiology, oral and maxillofacial surgery, orthodontics, prosthodontics, pedodontics, conservative dentistry and endodontics, periodontics, and community dentistry with applications used in dental research [Table 1]. The literature search of indices used in dental research is done in the PubMed database. The indices used in oral medicine and radiology specialty include indices for bone mineral density and bone quality evaluation. The panoramic mandibular index is useful for bone quality evaluation. Panoramic mandibular index, mandibular cortical index, and mental index are used to assess osteoporosis in premenopausal and postmenopausal, periodontally healthy, and chronic periodontitis women. Antegonial index, mental index, panoramic mandibular index, and mandibular cortical index values are found to be smaller among male patients with osteoporosis than normal males. The indices used in oral and maxillofacial surgery specialty include indices for orthognathic surgery. Index of orthognathic functional treatment need is used to study the eligibility for orthognathic surgery, and digital models are best alternative to plaster casts for determining the treatment need., Peer Assessment Rating is superior to the American Board of Orthodontics Objective Grading System in assessing the orthognathic surgery treatment outcome. The indices used in orthodontics specialty include indices for sexual dimorphism, race identification, and orthodontic treatment. Sexual dimorphism is calibrated from the mandibular canine index and mandibular first molar index; race identification from the cephalic index. The index of orthodontic treatment needs to measure the necessity for orthodontic treatment needs in various populations., Salzmann index is also used to assess orthodontic treatment priority. Conservative dentistry and endodontics specialty use the PUFA index which records the severely decayed teeth with visible pulpal involvement (P/p), ulceration caused by dislocated tooth fragments (U/u), fistula (F/f), and abscess (A/a). More recently, a cross-sectional study was done to correlate PUFA index and oral health-related quality of life of a rural population in India. The indices used in periodontics and community dentistry specialties include indices for oral hygiene, oral health, dental health, dental plaque, dental calculus, dental debris, dental caries, dental fluorosis, gingivitis, periodontitis, and periodontal treatment. A detailed description of indices related to periodontics and community dentistry is already available in standard textbooks, and it is not detailed in this paper. This paper gives an insight to aspiring dental researchers about various indices used in dental research so that active collaboration between different dental specialties will be possible for quantifiable research globally. Dental indices 2018. Available from: http://www.codental.uobaghdad.edu.iq/uploads/lectures/3rd%20class%20community%20dentistry/1%20Dental%20Indices.pdf. Viswanathan V, Juluri R, Goel S, Madan J, Mitra SK, Gopalakrishnan D, et al. Apoptotic index and proliferative index in premalignant and malignant squamous cell lesions of the oral cavity. J Int Oral Health 2015;7:40-3. Tandon A, Singh NN, Brave VR, Sreedhar G. Image analysis assisted study of mitotic figures in oral epithelial dysplasia and squamous cell carcinoma using differential stains. J Oral Biol Craniofac Res 2016;6:S18-S23. Pinto GDS, Costa FDS, Machado TV, Hartwig A, Pinheiro RT, Goettems ML, et al. Early-life events and developmental defects of enamel in the primary dentition. Community Dent Oral Epidemiol 2018;46:511-7. Li Y, Chen X, Chen S, Janal MN, Sarnat H. Developmental defects of enamel increase caries susceptibility in Chinese preschool children. Community Dent Oral Epidemiol 2018;46:500-10. Kwon AY, Huh KH, Yi WJ, Lee SS, Choi SC, Heo MS, et al. Is the panoramic mandibular index useful for bone quality evaluation? Imaging Sci Dent 2017;47:87-92. Kolte RA, Kolte AP, Potey AM. Risk assessment of osteoporosis in pre- and postmenopausal periodontally healthy and chronic periodontitis women with digital panoramic radiographs. J Indian Soc Periodontol 2017;21:461-5. Dagistan S, Bilge OM. Comparison of antegonial index, mental index, panoramic mandibular index and mandibular cortical index values in the panoramic radiographs of normal males and male patients with osteoporosis. Dentomaxillofac Radiol 2010;39:290-4. Fowler P, King T, Lee M, Erasmus J. Retrospective study of eligibility for orthognathic surgery using the index of orthognathic functional treatment need (IOFTN). Br J Oral Maxillofac Surg 2018;56:416-20. McCrory E, McGuinness NJ, Ulhaq A. Reproducibility of the index of orthognathic functional treatment need scores derived from plaster study casts and their three-dimensional digital equivalents: A pilot study. J Orthod 2018;45:94-101. Shamim T. Forensic odontology. J Coll Physicians Surg Pak 2012;22:240-5. Vishnoi P, Shyagali TR, Bhayya DP. Prevalence of need of orthodontic treatment in 7-16-year-old school children in Udaipur city, India. Turk J Orthod 2017;30:73-7. Alhummayani FM, Taibah SM. Orthodontic treatment needs in Saudi young adults and manpower requirements. Saudi Med J 2018;39:822-8. Lindauer SJ, Thresher AA, Baird BW, Sheats RD, Rebellato J. Orthodontic treatment priority: A comparison of two indices. J Clin Pediatr Dent 1998;22:125-31. Shaik S, Alamodi E, Alshahrani G, Alfaifi KH. Radiographic screening of patients in a dental school using the Prosthodontic diagnostic index. J Contemp Dent Pract 2017;18:501-5. Antony PJ, Pillai KS, George GB, Varghese T, Puthalath MS, Arakkal LJ, et al. Applicability of berry's index in bite mark analysis. J Forensic Dent Sci 2015;7:28-31. Bhagat S, Gupta V, Tyagi N, Sharma E, Gupta S, Dadu M, et al. Berry's index: Adjuvant to bite marks. J Forensic Dent Sci 2018;10:45-9. Tiwari S, Dubey A, Singh B, Avinash A. Clinical consequences of untreated dental caries evaluated with the pulpal involvement-roots-sepsis index in the primary dentition of school children from the Raipur and Durg districts, Chhattisgarh state, India. Med Princ Pract 2015;24:184-8. Baginska J, Rodakowska E, Wilczko M, Kierklo A. Caries assessment spectrum and treatment (CAST) index in the primary molars of 6- to 7-year-old polish children. Oral Health Prev Dent 2016;14:85-92. Monse B, Heinrich-Weltzien R, Benzian H, Holmgren C, van Palenstein Helderman W. PUFA – an index of clinical consequences of untreated dental caries. Community Dent Oral Epidemiol 2010;38:77-82. Praveen BH, Prathibha B, Reddy PP, Monica M, Samba A, Rajesh R, et al. Co relation between PUFA index and oral health related quality of life of a rural population in India: A Cross-sectional study. J Clin Diagn Res 2015;9:ZC39-42.